As an avid electronics enthusiast, I’ve always been fascinated by any hobby that involves electricity which moves objects. Model train building is a lifelong passion and hobby for many people, and it has been for many generations. Here at MakeUseOf, we’ve covered a lot of topics that involve ways you can use outside applications to control your PC; such as Ben’s article on how to control your PC using Remote Access 3 Tools to Control Your PC from A Distance Using Remote Access 3 Tools to Control Your PC from A Distance Using Remote Access Read More , or my article on 3 ways to remotely restart your computer over the Internet 3 Easy Ways To Restart Your Computer Over The Internet 3 Easy Ways To Restart Your Computer Over The Internet Read More . But, what about controlling other things with your computer? Specifically in the world of model train building and operation, the ability to design model train layout plans, and then control a model train with your computer would be very cool. This is where CATrain comes in. CATrain is a very cool Windows app written by a guy by the name of Joel Bouchat over in France. With his application, you can design and lay out a complete model railroad track, design a timed “itinerary,” and yes – you can even hook up your train to your computer and automate your model train. When I first discovered CATrain, from the screenshots I thought that it would be a simplistic, amateur application. Maybe it’s because I’ve spent too many years playing graphically intensive games like SIM City or Roller Coaster Tycoon. A video game CATrain is not. Once you install the application, it quickly becomes apparent that what you’re dealing with here isn’t so much a simulator style game, but more of a design application that comes preloaded with everything you might need to accurately lay out a model train railroad. The app first comes up in design mode, and you’re offered a pallet full of the various train track segments that you’d find in most model railroad kits. The learning curve for folks already familiar with most Windows applications is essentially zero. It’s all drag and drop – that’s it. As you click a track segment, it attaches to your mouse pointer. Move your mouse over to the grid section that you want to fill and the application provides a tip with your options at the upper right hand corner of the application (nice touch!). Once you have a decent model train layout plan, you can switch the application mode over to add elements like the power supply and signals (electrical design), set the grades of track segments, or switch the application over into “run” mode. Under Display options is where you’ll find the bulk of how you configure the on-screen appearance of your design and where you can configure the itinerary for your train. It’s also where you open up the throttle and device controls, a critical part of the application if you plan to simulate the operation of your train on the screen, or control your real train off the screen. The next menu item is where you can view the wiring configuration of your design track to make sure that you’ve placed the correct connections together, and that the polarity of the power supply is correct. When you select the “show polarity” option, it shows up overlaid on top of the track as shown above. Ready to place your simulated train on your new model train layout plan? When you go to select “Place a Train on the Railway” under the “Trains” option, you’ll be pleasantly surprised to find a total of 30 train types. You also have the option to edit your own train. Once you’ve selected your train, bring your mouse over to the track and left click to place it wherever you’d like the train to start, the application pops up the throttle control icon as shown above. I’m afraid my pathetic little track won’t exactly provide the opportunity for a fun itinerary for this poor little train. However, the application comes preloaded with a long list of pre-designed model train layout plans (under the TCI folder), and when you see the creativity (and complexity) that went into some of these designs I’m sure you’ll be as surprised as I was. Of course, on top of the well-written design software (and free on top of that), the best part of this software is its ability to actually control your model railroad hardware. When you install the application, you’ll notice a USB driver installed along with it for that purpose. However, this is where the “free” stops, because obviously to control your model train you need the microprocessors to plug your computer into in order to do so. Required hardware includes a USB interface, PWM controller, device controller and train detector. Joel sells these pre-made, or you can buy the electrical schematics to build them yourself. Whether you choose to use his hardware, or you build it yourself, CATrain represents at least one very cool way that you can interface between your PC and something in the real world that you can actually control. 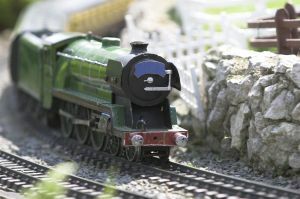 Are you a model train enthusiast? Have you ever hooked up your PC to control something in the real world? Tell us about it in the comments section below. i do not know, where "Ken" downloaded CATrain - we didn't found any virus in our files. Please, tell us, where you download it. I installed CATrain (tried to download from both webservers given on the download page) as soon as it finished installing both times, my Virus scanner detected a Trojan Virus. Just thought people should know. I saw multiple links and got mine from the one marked as "english," if I remember correctly - and my updated virus scanner detected no issues. There were more than two links - do you mean you tried from both English sites? Thanks for spotting this - if there's any virus issue it'll be good to let readers know.